So… I see this SHINING endorsement for Remy Stephanson Leonard from Mark Roe in the local paper. ANYONE he endorses should be suspect More importantly is “when” Mr Roe wrote this endorsement… A prosecutor should NOT be endorsing Judges, that DEFINITELY gives the appearance of impropriety, & they most certainly shouldn’t be doing it on county time. I really don’t wanna punish all Dist ct divisions, their employees, and judges, for the actions primarily of one judge in arlington. (we have tried to talk with him, but he won’t even meet with me……. )I wish he would just retire! Though 2 south judges can be a pain, 80% of the problem is well north of there. simplest step is close just that one, split their cases between everett and evergreen, and either eliminate or allow the commissioner to rove to where needed, instead of being tied to do all the work for the one judge who doesn’t often come to work. our filings are way down. I don’t think they need 8 judges plus a commissioner, and said that before tony was appointed. If cascade were closed, I guarantee that the other cts would be on the very best super duper behavior forever more! 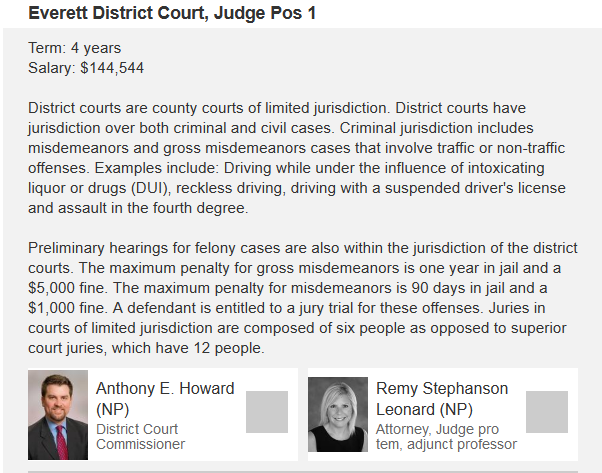 2) Judge Stephanson Leonard is the city of Everett’s Mayor’s daughter. Nepotism and Cronyism Favoring relatives (nepotism) or personal friends (cronyism) of an official is a form of illegitimate private gain. This may be combined with bribery, for example demanding that a business should employ a relative of an official controlling regulations affecting the business. The most extreme example is when the entire state is inherited, as in North Korea or Syria. A lesser form might be in the Southern United States with Good ol’ boys, where women and minorities are excluded. A milder form of cronyism is an “old boy network“, in which appointees to official positions are selected only from a closed and exclusive social network – such as the alumni of particular universities – instead of appointing the most competent candidate. Seeking to harm enemies becomes corruption when official powers are illegitimately used as means to this end. For example, trumped-up charges are often brought up against journalists or writers who bring up politically sensitive issues, such as a politician’s acceptance of bribes. So we’ve got them trying to make the city of Everett prosecutor Mike Fisher the Judge, & Judge O’Dell is going to bail out on the voters & put Mike Fisher in his place as the sitting Judge So why did Judge O’Dell even run if he was just going to bail out anyway? To ensure that he could keep his friends in power, & to ensure that the groundwork they have laid out stands firm as far as the corruption is concerned. Are you starting to see how they put their buddies in power so they can keep absolute supreme control over the county & the various cities? THAT IS WHAT WE HAVE TO STOP. If we can get rid of the corrupt officials & we solve 90% of the problem but it’s been this way here for over 40 years so it’s not going to change overnight. All it takes is for the citizens to vote smarter… You can lead people to the polls but you can’t make them vote smarter. Then just to add to the cronyism… the Snohomish County Auditor’s husband also writes a op-ed endorsement for her so now we know she is connected to Mark Roe & the Weikel’s (Gary & Carolyn) Gary being the county exec who was ousted by Aaron Reardon, but who still has his hands in many aspects of Snohomish County politics. Then there is also the local paper… why are they posting so many pro opinions for her? Hmmmm….. This list should be a very clear WARNING to vote for ANYONE else besides her, anyone. If she gets in then the people have NO ONE to blame but themselves.